To help you prepare for the Pre-Trip Inspection CDL test, we have compiled 50 questions from the actual Pre-Trip Inspection tests administered by the DMV from states all across the country. Each question is worth two points for a total of 100 possible points. A passing score is 80%. We have created both a Pre-Trip Inspection Practice Quiz and a Pre-Trip Inspection Practice Test. The Pre-Trip Inspection Practice Quiz reveals the correct answer during each question to help you study for the actual Pre-Trip Inspection CDL test. The Pre-Trip Inspection Practice Test doesn’t reveal the correct answers until the test is over. The questions and answers are given in random order each time you retake the test. When you are finished testing, simply click on the “Get Results” button to see your test results. Clicking on the blue “List” button will reveal a list of all the questions you answered correctly and incorrectly. To take the test again, just refresh your browser window. It’s that easy. Press the start button to begin your free Pre-Trip Inspection Practice Quiz. Good luck! With a dual air system, the air pressure should increase from 85 psi to 100 psi within ______ seconds, while running the engine at ______ RPM. Excluding the front tires, what is the minimum tread depth for tires? When pumping the brake pedal to release the spring brakes, when should the air brake buttons pop out? You do not check the ______ on every tire. When inspecting the landing gear make sure the ______ is not ______. The heater and defroster must be checked during the pre-trip inspection. True or False? Check to make sure the joints and ______ are not ______ and that there are no missing nuts, bolts, or cotter keys. You should clean all the reflectors, lights, and glass as you perform the pre-trip inspection. True or False? Start the engine and listen for abnormal engine noises. Check to make sure all your gauges look normal. Check to make sure the parking brake is on. Check to make sure your horn is working correctly. The truck grill must not be ______. Not performing an air brake check during the pre-trip inspection will result in an automatic failure. True or False? Where should you clean and adjust the mirrors? Neither of these answers are correct. Either of these answers are correct. When inspecting the frame, you must check to make sure there are no ______. The ______ are not inspected in the engine compartment. If equipped, the ______ must operate properly. During the ______ part of the pre-trip inspection, you should look underneath the vehicle for fresh ______ leaks. The ______ needs to be inspected for missing ______, ______, and ______. The turn signals/hazard lights must be ______. When inspecting the tires the ______ should not be missing, broken, or damaged. According to federal and state laws, truck drivers are required to inspect their vehicle ______ a trip. The outer hub oil seal must not be ______. The wheel rim must not have ______. During the pre-trip inspection, you should check to make sure you have which emergency items? Spare electrical fuses, flares, and an emergency flashlight. Spare electrical fuses, emergency flashlight, three reflective red triangles. Spare electrical fuses, three reflective red triangles, and a properly charged and rated fire extinguisher. Fully charged cell phone, emergency flashlight, and a properly charged and rated fire extinguisher. The hood of the truck must be ______. The tire pressure must be ______ psi. The header board is located on the ______ of the trailer and is supposed to protect the ______ in case of an accident. When testing the low pressure warning system, when should the alarm sound? Before the pressure drops below 110 psi. Before the pressure drops below 120 psi. Before the pressure drops below 40 psi. Before the pressure drops below 60 psi. Before the pressure drops below 10 psi. When inspecting the hub oil seals and axle seals, if the wheel has a ______, then the oil level is ______. The depth of the tread on the front tires must be ______ of an inch. When you start the engine, the ______ gauge should build air pressure to governor cut-out at approximately ______ psi. After you've inspected the engine compartment, front of the vehicle, rear of the vehicle, rear of the tractor/truck, and the front of the trailer, you should inspect the ______ next. You ______ the brakes ______ performing a static leak test. When you are inspecting the engine compartment hoses for leaks or cracks, the engine should be ______. Any of these answers are correct. start the engine, depress the clutch, place the gearshift into neutral (or park for automatic transmissions), release the clutch slowly. depress the clutch, start the engine, place the gearshift into neutral (or park for automatic transmissions), release the clutch slowly. depress the clutch, place the gearshift into neutral (or park for automatic transmissions), start the engine, release the clutch slowly. depress the clutch, place the gearshift into neutral (or park for automatic transmissions), release the clutch slowly, start the engine. it will prevent anyone from moving the vehicle while you are underneath inspecting it. you will need the key to open the side box. you will need the key during the trailer inspection. you might misplace the key somewhere. When you first approach the vehicle to perform the pre-trip inspection, you should look underneath for fresh leaks? True or False? When you first approach the vehicle to perform the inspection, you shouldn't check for damage to the vehicle. True or False? The windshield must not be ______. Wheel bearing seals should be inspected thoroughly for______. When inspecting the drive shaft, the ______ should be secure and free of ______. The ______ gauge should rise ______ to the normal range when you start the engine. When inspecting the air/electrical connections, the ______ should be ______ and free of any ______. The horn must be checked during the pre-trip inspection. True or False? During the pre-trip inspection, the ______ does not get checked at the rear of the trailer. You should perform the same exact pre-trip inspection routine each time so that you learn all the steps and don't forget anything. True or False? Left and right turn signal and high beam lights only. Left and right turn signal. During the pre-trip inspection, you should always start with the service brake check when doing the air brakes test. True or False? During the in-cab inspection, ______ steering wheel play should not exceed ______ degrees or about ______ inches on a 20-inch wheel. The Pre-Trip Inspection Practice Test doesn’t reveal the correct answers until the test is over. The questions and answers are given in random order each time you retake the test. When you are finished testing, simply click on the “Get Results” button to see your test results. Clicking on the blue “List” button will reveal a list of all the questions you answered correctly and incorrectly. To take the test again, just refresh your browser window. 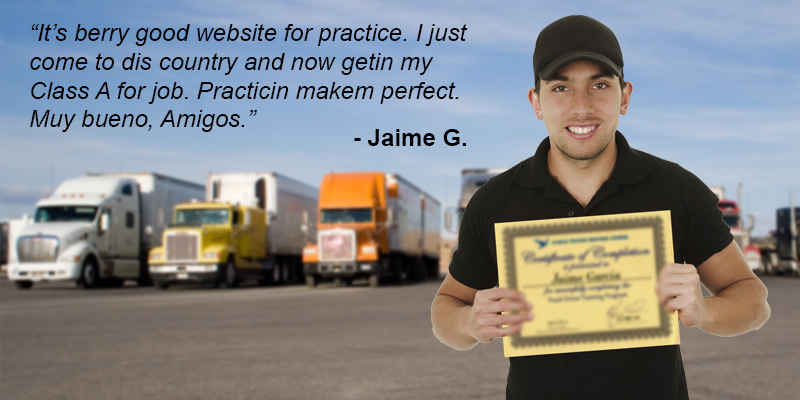 Press the start button to begin your free Pre-Trip Inspection Practice Test. Good luck!